Sometimes you start with a goal in mind then a couple of days later you have built something interesting but totally unrelated to what you originally intended to do…. I have several devices (both Netduino & Arduino) which I want to use to collect and upload data to the cloud so I can monitor the resource usage of my house. I had read Clemens Vaster post on Service Assisted Communication and I was planning to use a Windows Server Essentials 2012 box I have running 24/7 in the hallway to forward updates to the cloud. After spending a few hours trying to get the CrazyRadio dongle working I looked at my Crazyflie Nano QuadCopter sitting on the bookshelf. Then I realised what I really needed is a more portable Crazyflie remote control unit so I didn’t have to unpack my laptop. So two nights later I have a proof of concept Netduino based Crazyflie Nanocopter remote control unit. This software was built using tooling created and shared by others. Mike McCauley – NRF24 library for Arduino. I used the NRF24 CrazyFlie emulator to debug my project. No doubt stopping me crashing my Crazyflie many times while debugging. The Joystick shield has to be modified to work with the common Netduino nRF24L01 libraries which use interrupts rather than polling. The joystick on the shield is for roll and pitch, the external joystick is for thrust and yaw. The first version of the JoystickShieldnRF24l01V1.0 is pretty basic but I’ll try and enhance it over the next couple of posts. 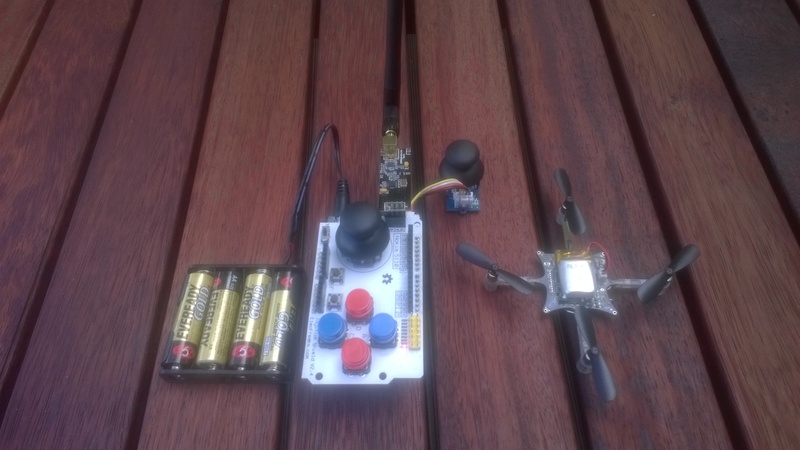 This entry was posted in .NetMF, Crazyflie, Netduino, Quadcopter and tagged Bitcraze, Crazyflie, elecfreaks, embeddedcoolness, Netduino, NetMF, nRF24L01, quadcopter, seeedstudio. Bookmark the permalink. Oh, I love the helicopter! !